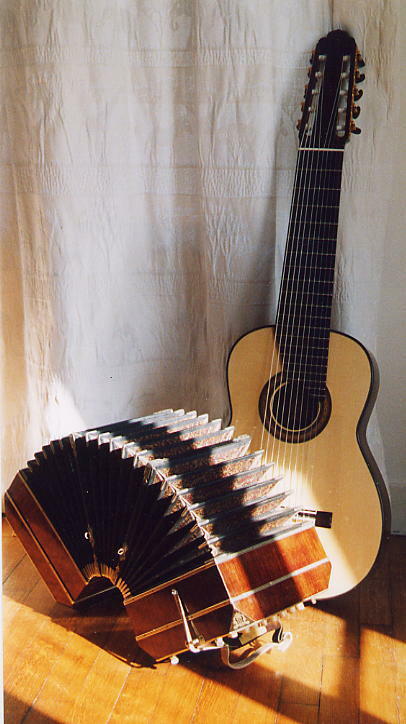 The bandoneon is an instrument with bellows, belonging to the accordion group. It is far smaller than its cousin, the accordion, sized 23 cm x 25 cm, but bigger than the concertina. The bandoneon has two square resonance blocks, of which the right side is reserved for treble voices (a-b”’) and the left-side for lower register voices (C-b). 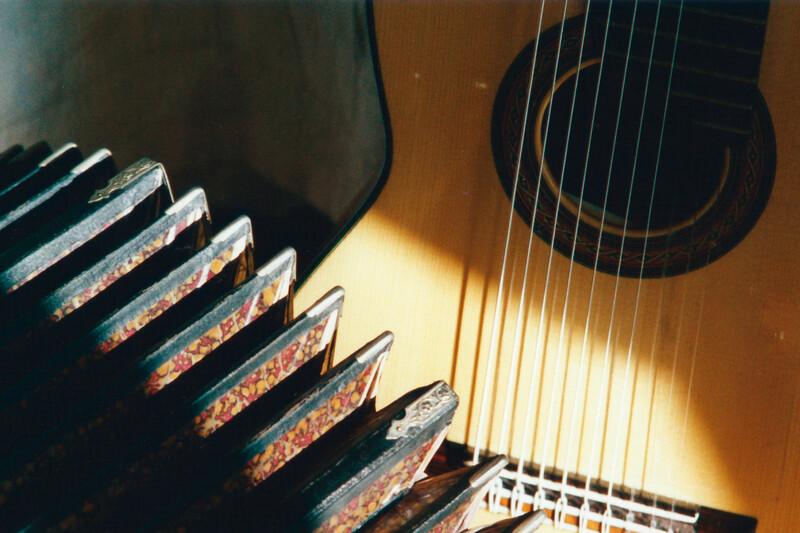 The flexible bellows of the bandoneon stretch up to one metre. When the bellows are fully compressed, the length of the instrument is 35 cm. In Argentina, the bandoneon has gained its greatest popularity. However, its origins lie in Germany. In 1851, Carl Zimmermann, a musical instrument builder from Carlsfeld, presented his new invention, the “Carlsfelder Concertina”, in The Great Exhibition of the Works of Industry of All Nations. At first, the bandoneon became a popular instrument among German miners, but soon its popularity spread to a wider public. It was regarded as “the piano of the lower-class”, as a bandoneon was cheaper than an accordion; moreover, it had a so-called Wälscheleine system with signs and numbers for those who could not read music. In the miners’ evening gatherings the instrument was used for playing marches, waltzes and polkas for the people to dance to. In 1874, the first bandoneon society was established in Chemniz, and soon the number of bandoneon societies outnumbered football clubs in Germany! By 1927, the German Konzertina and Bandoneon Union represented more than a thousand societies with 14,000 members. The legendary “Double A” bandoneons, which were produced by the Alfred Arnold Bandoneon and Konzertina Factory, established by the Arnold brothers Paul and Alfred, are considered the world’s best bandoneons, the “Stradivari” of this instrument. After the end of the World War 2, bandoneon playing grew less popular, so, in the late 1940s, the peak of popularity of tango music being over, the production volumes were greatly scaled down, until the workshop, (lead by sons of Paul and Alfred), finally closed in 1971. After a few decades in obscurity, the new rise in the bandoneon’s popularity is due to the famous bandoneon player and composer Astor Piazzolla. His work and career along with the Tango Nuevo music he wrote has brought this instrument back into the limelight all over the world. Decacorde, or the 10-string guitar, is a rare variation of the classical guitar, relatively unknown even to many professional guitarists. Nevertheless, the extra strings added to the usual 6-string instrument are no novelty, but has a long history in many cultures. Thus, the evolution of this variation of the guitar shows influence from a number of different string instruments, the strongest coming from the lute family. The oldest 10-string guitars were actually instruments resembling a hybrid of a lute and a guitar. In the late 18th century, court musicians in Paris and Versailles used to play on this kind of ”lute-guitars”. It has been told that one of the most extraordinary variations of these string instruments was called ”bissex”, made by Naderman. A great number of experimental instruments appeared at that time, and most bizarre string instruments did see the light of day. Louis-Gabriel Besson, one of these court musicians, called one of these instruments a decacorde, referring thus to its ten strings. These 10-string guitars, however, had the extra bass strings placed outside the fingerboard. The decacorde made by René Lacote and designed by him in collaboration with the guitarist Ferdinando Carulli in the early 19th century, comes closest to the modern decacorde. Ferdinando Carulli himself played on this kind of guitar. Lacote made very different kind of decacorde models and one of the most interesting was that made for Carulli, which had a special tuning machine. Carulli also wrote a study book for this instrument, “Méthode compléte pour le décacorde”, opus 293. Tuning for his decacorde was e1, b, g, d, A, G, F, E, D, C At the Music Museum of the Cité de la Musique in Paris there are two of Lacote’s decacordes on display, made in 1826 and 1830. Ferdinando Carulli, together with the luthier Lacote, did valuable developing work with the 10-string guitar. Decacorde Much later, in 1963, the Spanish guitarist Narciso Yepes, together with the luthier José Ramirez, created the modern variant of this instrument. Indeed, the standard guitar itself had gone through a significant evolution from the early 19th century to the latter half of the 20th century, and the idea of Yepes and Ramirez was to make an updated version of the 10-string guitar. It looks like a standard modern guitar but has a broader fingerboard and larger tuning apparatus. Unlike Carulli’s guitar, the modern 10-string guitar has frets under all of the strings. He also used a tuning of his own in his guitar: Gflat – Aflat – Bflat – C-E-A-d-g-b-e1 . With the four extra strings, Yepes wanted to create so-called resonance strings for those tones which, in the standard 6-string guitar, are left without resonance. What is the charm of this guitar and what makes it so special? The power of this guitar, for one thing, lies in its resonance qualities, which both strengthen the sound of the guitar and lengthen the resounding time of each tone. The extra bass strings also give the instrument a slightly darker timbre than the 6-string guitar. Lute music, nowadays played generally on the guitar, comes into its own when played on the 10-string guitar, as the bass strings allow the playing of low octave tones in the original pitch. As a chamber music instrument, this guitar gives sturdier support to the ensemble than the 6-string guitar and it gives a wider range of expression to the chords. Modern composers are inspired by this rare form of the modern guitar which, with its rich sound and harmonies, as well as new possibilities of musical texture, opens new expressive horizons for the guitar. The tuning of the bass strings of the 10-string guitar varies according to the needs of the music played. I myself use the following tuning, which I may change according to my needs: A1, B1, C, D, E, A, d, g, b, e1. I have found this method of tuning to be the most practical one, as the low basses add their special timbre to the harmonies.